1. Put the lentils in a bowl; cover with cold water and set aside. Heat the oil in a large casserole or saucepan over a medium-high heat and add the onion, ginger and garlic with a pinch of salt. Fry for 8 minutes until turning golden. Stir in the curry powder, curry leaves, tomatoes and a good grinding of black pepper; cook for 2 minutes. 2. Drain the lentils and add to the pan, along with the stock and 250ml cold water. Bring to the boil, then turn down to a simmer and cook for 20 minutes until the lentils are soft. Stir in the chicken or turkey and the spinach, cover and cook for another 3-4 minutes, until the spinach is wilted. 3. Meanwhile, prepare the rice according to pack instructions. Check the seasoning of the curry, adding more salt, pepper and a squeeze of lemon juice to taste. Serve with the rice. 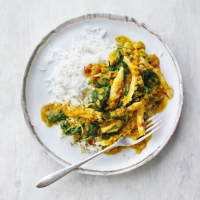 This curry offers a great way to use up leftover roast chicken or Christmas turkey. If you’d rather make the dish vegetarian, use chunks of roasted squash or lightly fried cubes of paneer instead. This recipe appeared within the December 2018 recipe card collection. This recipe was first published in November 2018.